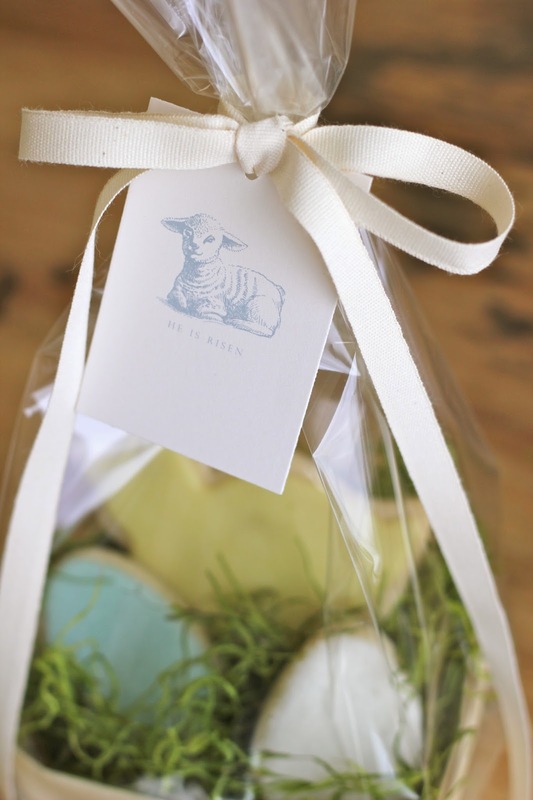 Today I added my new collection of Tags & Card, Cotton Ribbon, Bags and Baskets to the store for Easter. Enjoy! Every season I design a new set of Tags to attach to treats, and Folded Cards to use as Place Cards or Gift Cards. This time, I created two sets - one with a classic bunny and one with a very sweet lamb, both in a "pen and ink" vintage style. Easter is always a very colorful holiday, so I like to use more subtle colors (like this graphite grey for the bunny) for tags and cards to make any treat or gift look beautiful. These Bunny Cards come in both Tags & Folded Cards. Little Lamb "He Is Risen"
My Mom has always made an effort for us to remember "the reason for the season." At Christmas, that meant she didn't put the Baby Jesus in the Nativity scene until Christmas morning. She always makes a big display of adding the Baby Jesus before any packages are opened. Not a huge thing, but a nice way to take a moment to recognize the real reason for the holiday. You might remember for Thanksgiving, I designed "I Am Thankful For..." place cards for the Thanksgiving table - again, just a simple way to bring the true holiday to mind we sat down for the feast. 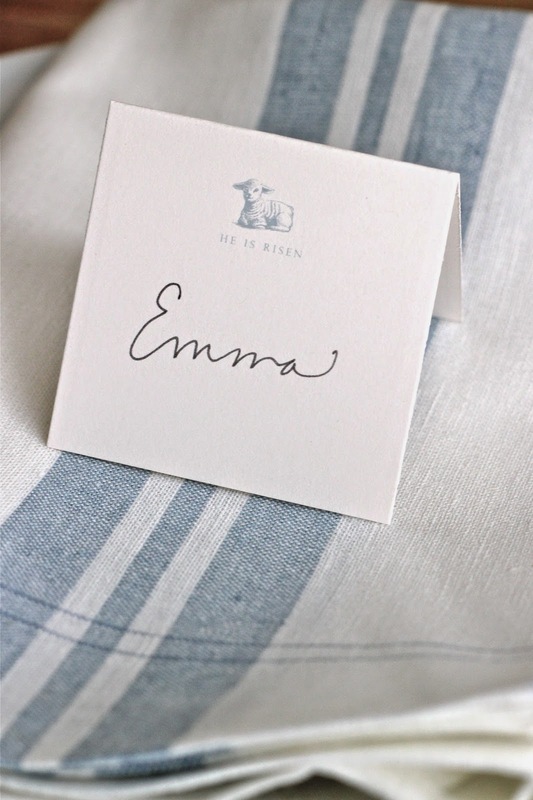 This year, I've designed these sweet Little Lamb tags and place cards for Easter to do the same thing - create a moment at the Easter brunch table that serves as a reminder of the 'reason for the season.' 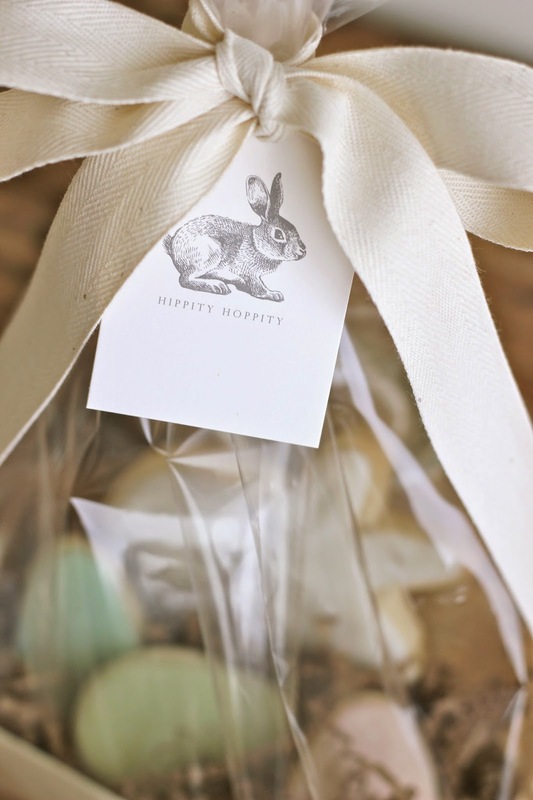 The tags would be beautiful addition to Sunday School teacher and friend treats. 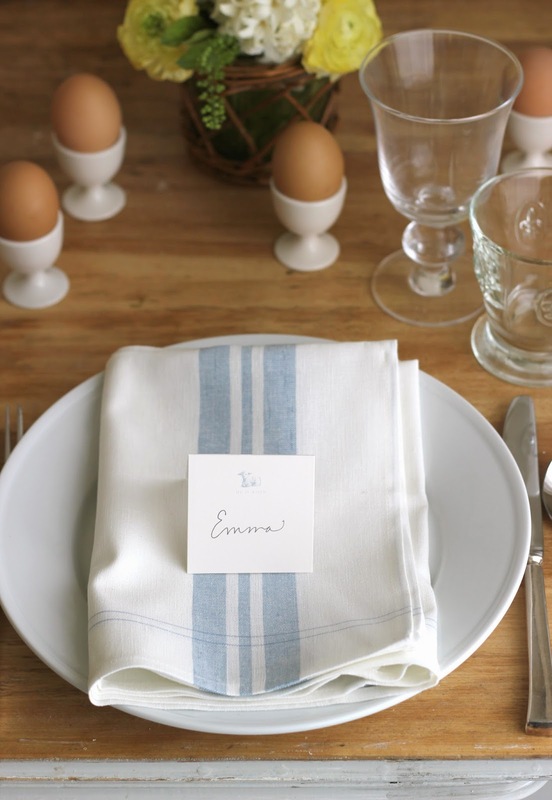 These cards happen to match my Light Blue Linen Tea Towels exactly - they make great napkins. I love anything that has a double use. 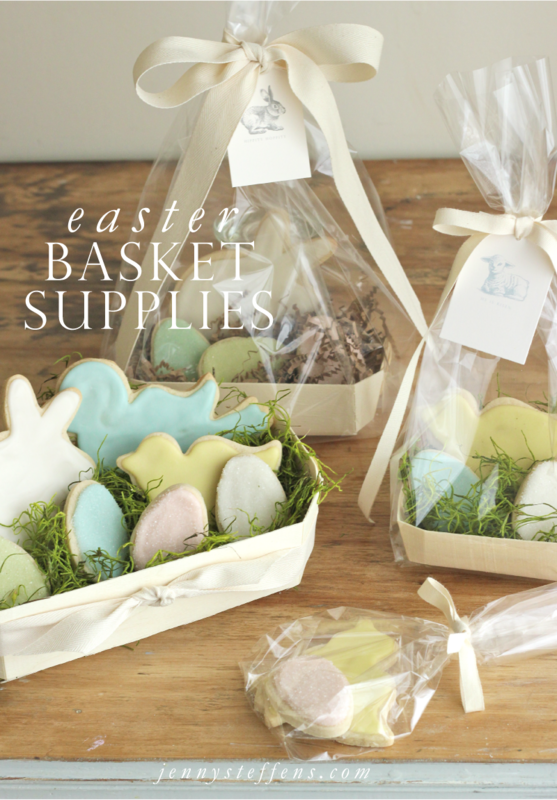 My collection of Wooden Baking Baskets make great mini Easter Baskets. 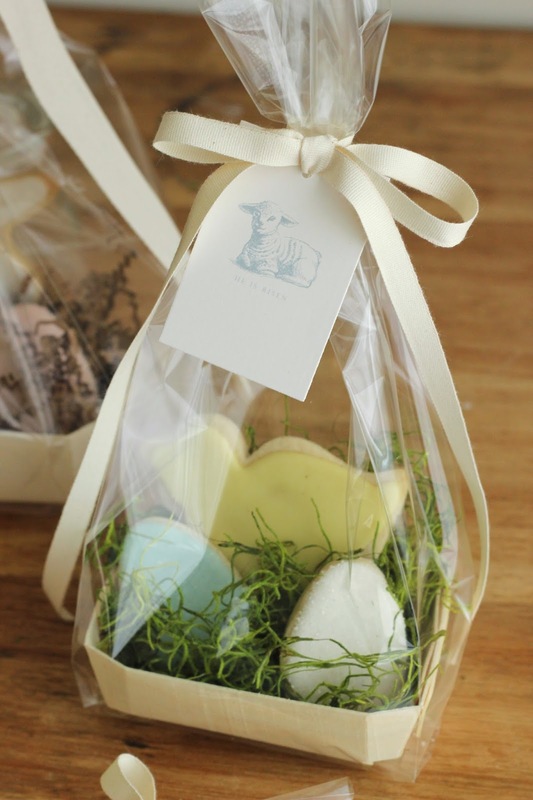 They would make a lovely hostess gift, or if you're hosting a great little gift to have for each of your younger guests. When we're entertaining, I love giving the kids a project to work on - like decorating cookies. 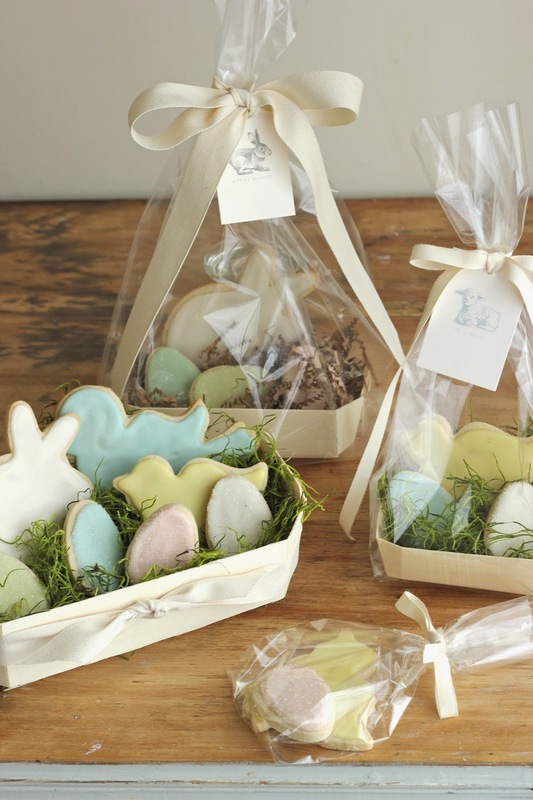 These baskets would be a great way to send all of their creations home in style. For basket fillers, I used my Spanish Moss and Kraft Krinkle. Until now, I haven't had a bag large enough to package the medium and large wooden baskets. I've added this Jumbo size for larger items. Of course, all of these cookies were made with my collection of Copper Cookie Cutters for Spring. Many of you have requested that I bring back Cotton Ribbon to the store. I've found two new versions that I love: the 1" Thick Cotton Ribbon is a herringbone twill cotton ribbon that is thick and lovely, and the 3/8" Thin Cotton Ribbon (made of organic cotton) is a natural and classic way to package anything from baked goods to gifts. This is the same ribbon that I've started using on my own products in the store.